For harvesting rose seeds, professional rose breeders or hybridizers control what pollen they want used to pollinate a specific rose bloom. By controlling the pollen used in the pollination process, they will know exactly who the parents of a new rose bush are. Out in our gardens we typically have no real clue as to whom both parents are since the bees or wasps do most of the pollinating for us. In some cases, the rose may pollinate itself. But when we know how to get seeds from a rose, we can then grow the rose seed and enjoy the delightful surprise that Mother Nature has created for us. What Do Rose Seeds Look Like? Once a rose bush has bloomed and the bloom visited by one of natures’ pollinators, or perhaps even the gardener attempting his or her own controlled breeding program, the area directly at the base of the rose bloom, called the ovary, will swell as the ovule (where the seeds are formed) begins the formation of the rose seeds. This area is referred to as the rose hip, also known as the fruit of the rose. The rose hips are where the rose seeds are contained. Not all blooms will form rose hips and many are likely deadheaded before the rose hips can truly form up. Not doing any deadheading of the old rose blooms will allow the rose hips to form, which can then be harvested either to use the seeds inside to grow a new rose bush of your own or are used by some to make various delights, such as rose hip jelly. Those that are harvested to grow a new rose bush have now begun the process known as rose propagation from seed. The rose hips are typically collected in late summer or fall once they have ripened. Some of the rose hips turn red, yellow or orange to help tell us when they have ripened. Be sure to place the rose hips in well marked, separate containers when harvesting them so it is easy to tell which rose they came from. Knowing which rose bush the rose hips and rose seeds came from can be very important when the new rose seedlings come forth so that you know the variety of the parent rose. 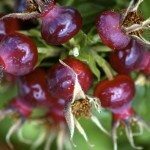 Once all of the rose hips have been harvested, it is time to process the seeds in them. Cut each rose hip open carefully with a knife and dig out the seeds, again placing them in containers with the name of the rose bush they came from. Once the seeds have all been removed from the rose hips, rinse the seeds off to remove any of the pulp from the rose hips still on them. With that, you are done harvesting rose seeds. 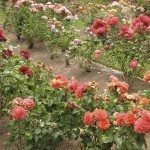 You can store your rose bush seeds in a cool, dry place for a short period of time or start right away with preparing the seeds and growing roses from seed. 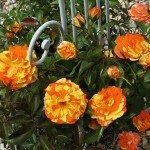 Learning how to get seeds from roses can be fun and easy.